This study compared spinal manipulative therapy to lumbar nerve root injections for treatment and management of pain associated with disc herniation. This was done to compare self-reported pain and 'improvement' of patients suffering from low back disc herniations. Note: this study refers to spinal manipulative therapy. For the sake of previty and readability we shall refer to this as chiropractic. This study also refers to imaging-guided lumbar nerve root injections. For the same reason, we shall refer to this as epidural injections. Do you suffer from disc pain, a bulging disc or a similar disc injury? Many people across Sydney seek treatment for disc pain, bulging discs, herniated discs and/or disc injury. If you have suffered from disc pain before, you'll know how painful it can be. You can read more about disc pain and injury in a recent blog post we published. Consider this: for disc pain, would you consider chiropractic care or epidural injection? 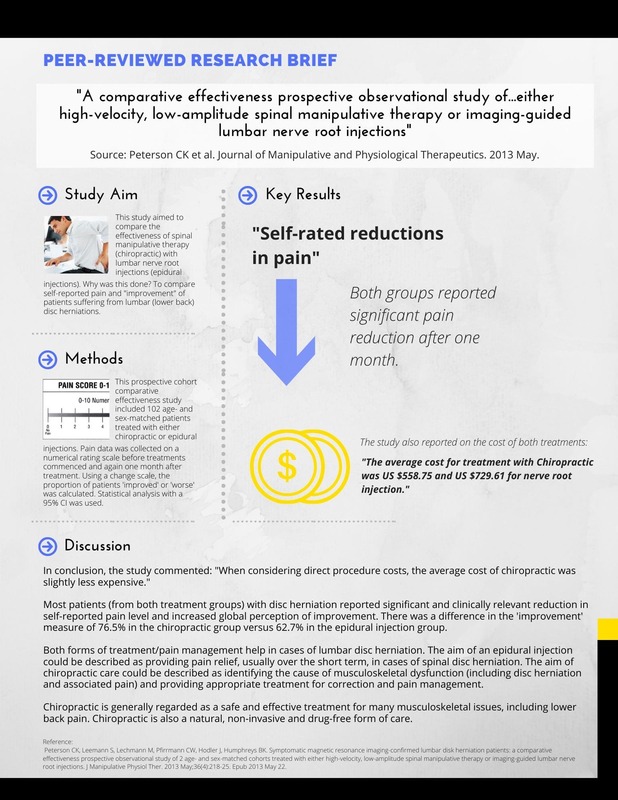 What the above research brief suggests is that both treatment options can be effective in reducing or managing pain. The interesting result is that in 'self-rated improvements', those patients receiving chiropractic reported an improvement rate of 76.5% compared to 62.7% for epidural injections patients. Most patients reported both significant and clinically relevant reductions in self-reported pain levels. The study also demonstrated that the average cost of treatment was less for chiropractic compared to epidural injections. In conclusion, this study reports that chiropractic provides a greater level of 'self-rated improvement' pain reduction compared to epidural injections. The reported average cost for chiropractic care was less than the average cost for epidural injections. When considering treatment options for disc herniation pain, a number of factors could be considered including: reported levels of improvement, treatment cost, short, medium and long term efficacy and the results of other scientific studies. To read more research reviews go back to our chiropractic case studies page. If you would like to discuss treatment options for disc injury or back pain, please feel free to call (02) 9819 6182 or email Lyons Road Family Chiropractic today.